I’ll be participating in an evening of readings by local writers on November 5th at 7:00pm at Bas Bleu Theater. There will be poetry, excerpts from novels and essays. Written and read by members of Northern Colorado Writers: Dean Miller, Nan Reed, Wanda Tierney, Nic Widhalm, David Jessup, Rich Keller and Stephen Benjamin. Doors open at 6:30pm and admission is $5. C’mon down! If you ever get a chance, go to Crested Butte, Colorado. Boosters call their town the Wildflower Capital of the World, with good reason. Our visit, on August 1, was two weeks later than the peak blooming season, but the valley was still spangled with yellow coneflowers, blue asters, red firecracker flowers and scores more. The Slate River meanders through the flat valley floor, meeting itself coming and going like a gray snake coiling for sheer pleasure through the green meadows. My reason for visiting was to give a presentation and book signing at the town’s Old Rock Library. Book club members had read Mariano’s Crossing and wanted to meet the author. I was only too happy to oblige. 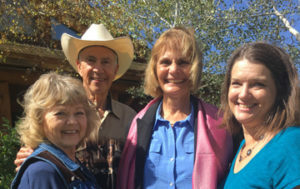 “Readers in the Rockies,” they call their author series. Not only are they enthusiastic, gracious hosts, they happily promoted my book to the local “Townie” book store, which bought several copies. Icing on the cake. Like many mountain resort towns, Crested Butte’s shops, restaurants, and art galleries draw crowds of tourists. But celebrity wealth is less on display than in Aspen or Telluride. It feels more accessible somehow. The Old Rock Library’s historic, two-story stone walls embrace a thoroughly modern, well-lighted interior, the kind of classy, comfortable place that makes you want to curl up with a good book when those summer rains fall. One cool thing about being a finalist for the Colorado Book Award is getting invited to speak at book events in interesting places. Crested Butte, Colorado, for example. I’m doing a presentation and book signing there on August 1st, 2013, at the “Readers in the Rockies” event. Never been there, but everyone tells me it’s a beautiful mountain town above the Gunnison River valley. Linda and I will be driving there with our Australian shepherd, Promise, for a two-day summer get-away. http://www.davidmjessup.com/images/Signature-David-J-just-one-for-inserting-1-300x119.jpg 0 0 David Jessup http://www.davidmjessup.com/images/Signature-David-J-just-one-for-inserting-1-300x119.jpg David Jessup2013-07-28 15:28:382013-07-28 15:28:38"Book Presentation at "Readers in the Rockies"
In response to the many readers who asked to visit some of the sites described in my historical novel, we took the first Mariano’s Crossing Tour on Saturday, June 15, 2013, at Sylvan Dale Ranch. Twenty-eight readers joined the tour. More wanted to come, so I’ll be scheduling another tour sometime in September. Stay tuned! The event began with breakfast in the old ranch building that still houses, behind the current walls, the remains of the original Alexander homestead dugout in the riverbank. The tour ended with a bag lunch on Red Ridge, the novel’s imagined location of John Alexander’s hideout and Lena’s secret grave. In between, we visited the Medina cemetery and the site of Mariano’s Crossing on the Big Thompson River. 8:00 AM. Breakfast in historic Sylvan Dale Dining Room. 8:45 AM. Walking tour of William Alexander Homestead, including the location of the original riverbank dugout inside the ranch kitchen, the original bridge supports, old barn, main ranch grounds, Indian tipi rings, and view of Mt. Alexander. 9:30 AM. Historic photo slide presentation at Wagon Wheel Bunkhouse. 10:00 AM. Depart for driving tour, car caravan to the Old Canyon, Boothroyd Graveyard, Weldon School ruins, Dry Creek, Marianna Butte, Medina Cemetery, and Mariano’s Crossing near Namaqua Park. 11:30 AM. Red Ridge (hikers and 4-wheelers only). 12:00 Lunch on Red Ridge at the “Hideout” overlooking the river valley below, or at Namaqua Park. COST: $55.00, paid in advance, plus tax (total $55.81). Includes full breakfast, sack lunch, meeting facility and tour. 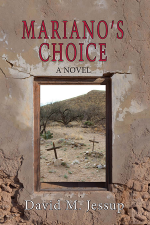 Mariano’s Crossing has been selected as one of three finalists for the Colorado Book Award in literary fiction, to be announced at the Colorado Book Award Celebration on Friday, June 21, from 1 to 4 PM, at the Doerr-Hosler Center at the Aspen Meadows Resort in Aspen, Colorado. I’ll be reading an excerpt from my book at a Finalist Reading Event, Thursday, April 25, 2013, from 6 to 9 PM at the Denver Press Club, 1330 Glenarm Place in Denver. C’mon down! Use the player below to listen to a my recent interview with 1310 KFKA’s Tom and Devon.